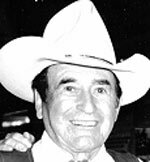 Cowboy roping legend Montie Montana was born Owen Harlan Mickel in 1910 either in Montana or North Dakota. He joked he was never sure where he was actually born because his parents moved around so much. Montie’s dad was an itinerant preacher who made the rounds of the churches in Montana and Canada on horseback. His dad also herded and sold wild horses while his mom performed a whip cracking act at the many rodeos they frequented in their travels. Montie was their fifth child and was raised predominantly around Wolf Point and Miles City, MT. As a very young child, Montie constantly practiced his roping skills. His first stint in show business came in 1925 when, at 15, he performed at the Miles City rodeo for $15. As he rode into the arena the announcer forgot his name and just proclaimed, “Here’s Montie from Montana.” Thinking this sounded pretty good, he adopted Montie Montana as his professional name. Montie finally moved on to California in 1929 and began his film career as a rider, roper, stunt double and actor. More than able to perform a lot of his own stunts, he was soon in demand to double many of the cowboy actors. Montana was one of the breed of real life cowboys who came to Hollywood in the ‘20s and ‘30s and lent their skill and daring to the new medium of film. For dozens of years after his move to Hollywood, Montie was a fixture at hundreds of rodeos around the country. He and his family made 60 appearances in the annual Tournament of Roses Parade telecast around the world from Pasadena, CA, each year. Montie ended his tenure with the parade in 1994. As with most real life cowboys, including Yakima Canutt and Montie, the studios tried to make new western stars out of them. 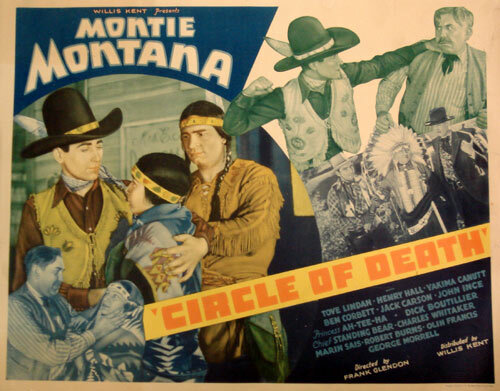 Montie’s chance came in 1935 with his lead in the seldom seen “Circle of Death”. His days as a B-western star lasted only one film, but he by no means was through with his work in movies, going on to appear with such stars as John Wayne, Kelo Henderson, William Boyd and Roy Rogers. Montie was untiring in his work with kids and visited dozens and dozens of schools doing his famed rope tricks and proudly displaying his trick horses he trained himself. 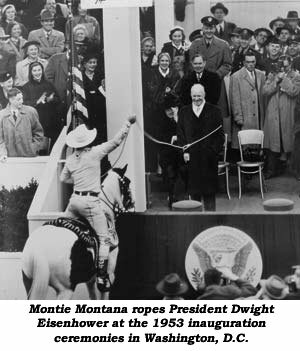 During the inauguration ceremonies for President Eisenhower in 1953, in Washington, DC, Montie made world headlines when he roped the President elect. Montie stated later he asked the President’s permission first, but the Secret Service was not amused. The photo with Montie’s rope around Eisenhower was on front pages of newspapers around the country. 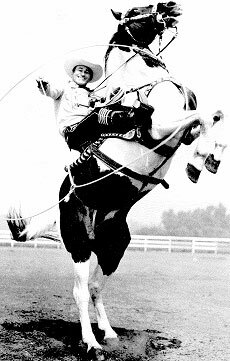 Montie performed for over 8 million children in Southern California alone and his roping and riding act was seen by hundreds of millions of people throughout the world during a career spanning almost seven decades. Inducted into numerous Cowboy Halls of Fame, he was beloved by rodeo cowboys and movie cowboys alike.